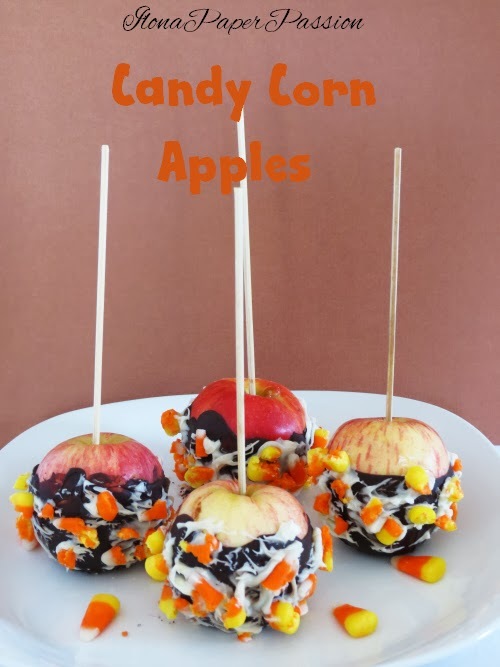 There are many ways to prepare apples for the Halloween or Fall Party. Today I used white and dark chocolate. To add a little color I used pieces of candy corn. Wash and dry apples. Insert wooden stick in each apple. Melt dark chocolate in microwave or use double boiler method (fill lower pan with water, bring water to simmer, take off from heat, put candy melts in top pan and stir). Add half teaspoon of oil to melted chocolate. 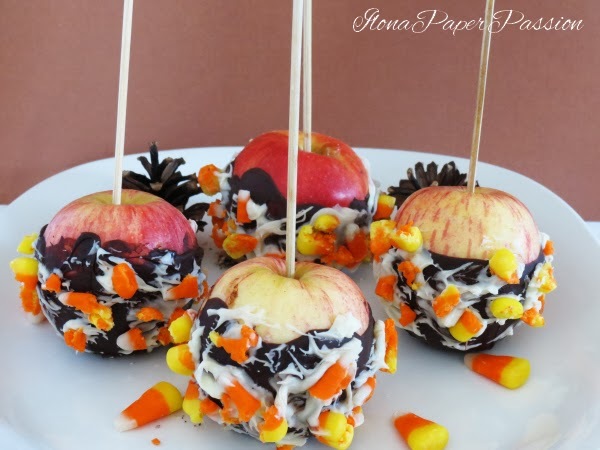 Dip each apple in chocolate. Let it dry. Cut candy corn into small pieces and set aside. Melt white chocolate. Add half teaspoon of oil to melted white chocolate. It will spread nicely. Put fork into the white chocolate and spread nicely on the apples. Affix candy corn right away. Wow those looks delicious! I actually love candy apples, the original kind with the red candy on the outside. There is actually a gormet shop here that sells apples with lots of different coatings from chocolate, candy and even gummy bears.